Environmental groups have repeatedly attributed the Four Corners methane “hot spot” over the borders of New Mexico, Colorado, Arizona and Utah to oil and gas development, using it as the focal point of their justification for the Bureau of Land Management’s (BLM) controversial venting and flaring rules on federal lands. But there is a huge issue with this strategy — the entire premise is not supported by the facts. 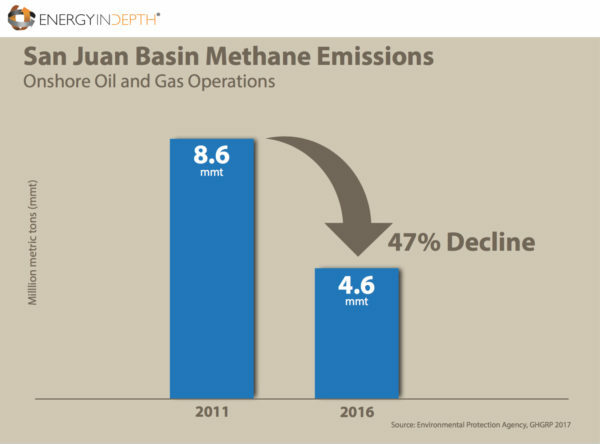 The latest Environmental Protection Agency Greenhouse Gas Reporting Program data show that methane emissions from large oil and gas facilities in the San Juan Basin have nearly been cut in half since 2011. According to the EPA’s data, the oil and gas sector reduced its methane emissions in the San Juan Basin by 47 percent from 2011 to 2016, dropping from 8.6 million metric tons (mmt) to 4.6 MMmt in just four years. And as Merrion Oil and Gas investment manager George Sharpe recently noted in an Albuquerque Journal op-ed, if the “hot spot” truly was attributable to oil and gas development, similar “hot spots” would exist in other areas of the United States more concentrated oil and gas infrastructure than exists than in this area San Juan Basin. This latest EPA data further confirms that efforts to use the four corners “hot spot” as a rallying cry to justify the BLM’s costly and duplicative venting an flaring rule are as misguided as the rule itself.